September: The end of summer is near. Our days become shorter. Many of us get our hopes up for the 'Skins to represent. Pumpkin food and drink pops up all over the place. Kids make new friends in school. Firestation-1 (8131 Georgia Avenue) and McGinty's (911 Ellsworth Drive) are great places to watch the games. Redskins play that following Sunday. Full schedule on the NFL website. Join representatives from the Maryland National Park & Planning staff go through the process from start to finish. 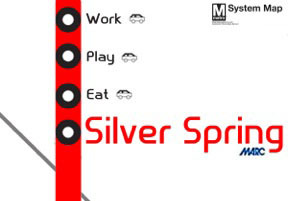 More info on the Silver Spring Speaks blog. One-week limited showing 9/7 – 9/13. Scoop up your tickets now through Fandango. Support the Silver Spring Town Center and donate your goods to their yard sale. Check out the list on their site for items they are seeking. If you have gardening questions, this would be a good time to stop by and get some advice to get your green thumb ready for fall. Check out their calendar for details. As per their website, this festival "showcases the best filmmaking from Latin America and, with the inclusion of films from Spain and Portugal, celebrates Ibero-American cultural connections." Stop by the AFI Silver Cafe every Thursday and Friday during the festival from 5:30 to 7:00 p.m. for Happy Hour. The Happy Hours will feature complimentary snacks courtesy of Nando's Peri Peri, Latin American drink specials and music. NOTE: Happy Hour specials are valid only for AFI Latin American Film Festival pass holders and ticket holders to films playing on the given dates. "Send for the Doctor: Researching the Life and Times of Dr. Edward Stonestreet, 19th Century Physician and Civil War Surgeon"
Street fest celebrating the people, artists, musicians and establishments in the community. Music and dance from around the world on 7 stages. Children's activities include: interactive musical games and dancing, and storytelling. In regards to the Scion opening, as per one of the owners, looks like they don't have a specific launch date at this time. They are currently awaiting construction and are very much looking forward to joining the neighborhood. I also noticed that the H&M site hasn't even posted for jobs/hiring. From my retail days, hiring for sales staff is usually something that comes a 3-4 weeks prior to opening. So - not sure if this means we might possibly be looking at middle/end of October. If you have questions regarding the events posted, please reach out to them directly. If there's something I missed, please shoot me an email or tweet to me at MyLineIsRed. My Line is Red Wine. It's also Liquor and Beer.